They were very easy to wear - the fleecy lining was very comfortable against my skin and was certainly welcome on colder, windy days. The material has no stretch at all but nonetheless the freedom of movement was fine over a variety of stiles and a few short, shallow scrambles. The Regular length was perfect on me (I'm 5'7'') - the bottom of the legs are not too wide so there was no annoying flapping. They've washed well, dried relatively quickly despite the fleecy lining and were ready to wear straight from the line. There are six pockets - 2 zipped at back, 2 jean-style at front, 2 zipped side pockets. However, these are all relatively small and I found the zip 'pulls' all a little fiddly particularly with gloved hands. The material appears to be reasonable robust - I've walked through a variety of overgrown paths and so far they've emerged unscathed. The rain repellancy held up in light drizzle for about 10 mins - but thereafter they became pretty sodden. 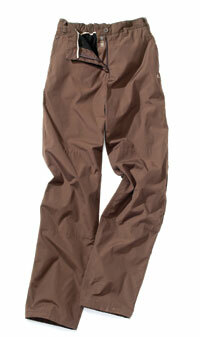 The Craghoppers Kiwi Winter trousers for women are relatively heavy-weight, warm trousers - a great option for low/mid-level walking in cold, dry conditions.